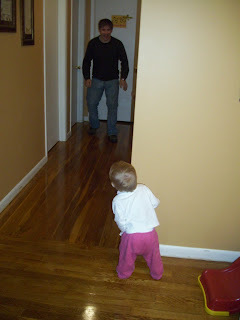 For awhile after Christmas, Avery's favorite game with Daddy was to jump out and surprise the other and then chase down the hallway. 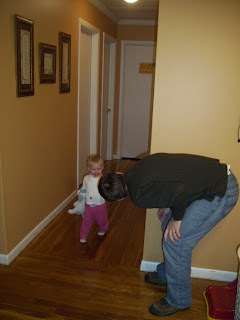 The best part to watch though was that Avery was just as happy to hide and surprise and she was to run and be surprised. Sweet. In January, Aunt Amber came to visit us for the weekend. It was great fun and Avery learned to say Amber's name which was fun! While Amber was here we also played some card games, which you can see is much more complicated than it used to be! 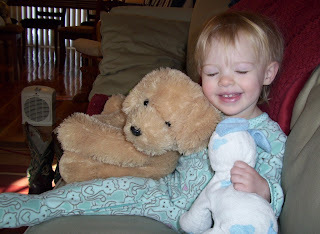 Here is Avery with her 2 favorite buddies. The puppies are Jellybean and Ruff-Ruff and she cannot sleep for any amount of time without them. 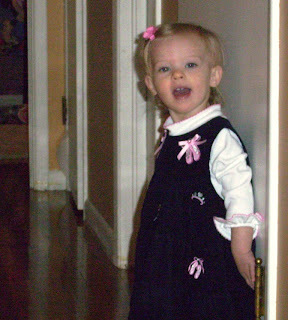 Last Sunday, Avery wore this cute dress to church. I realized how infrequently I pull out the camera lately, so I just snapped a few cute ones while the barrette was still in her hair. This one is of Avery naming the pictures in one of her books. She can name about 97% of the items in this book, but this is about the 5th time I had tried to capture it and she didn't last long. This is just an everyday video. Avery is playing with the kitchen Grams and Bob-Bob bought her for Christmas. 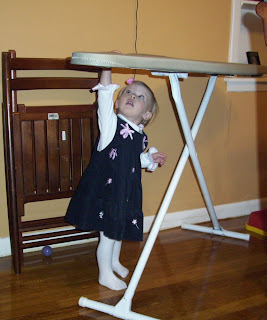 She is so fun to watch making noises and repeating actions she sees us doing in the kitchen. Unfortunately, it is difficult to catch on camera. She gets camera shy if she knows it is around. Ok, with that consider us back in the blogging business. Of course I mean back with no guarantees as to future postings. With a new baby on the way though, I suppose a few more postings are inevitable. Sometime before the due date of Sept 4th I hope we have sonogram pictures to share. Stay tuned! aggghhh Your precious baby is going to be a teenager before I get to Kansas! Slow her down just a notch... just kidding. Wow, she is so much fun to watch! I love those videos and I know Grandparent's will not be the only one who will adore them!